A peanut butter and jelly sandwich you can eat with a spoon! Cut toast into bite-sized pieces. In a small bowl, mix ½ cup of yogurt with jelly. In another small bowl, mix ½ cup of yogurt with peanut butter. 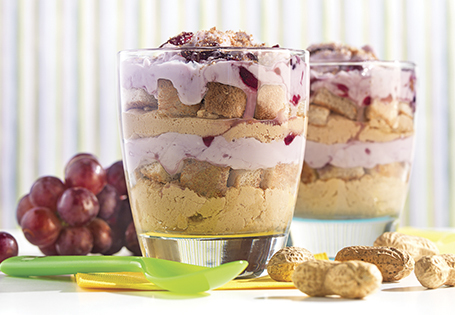 Layer ¼ of the peanut butter mixture in each of 2 medium glasses. Follow with ¼ of the toast pieces and ¼ of the jelly mixture. Repeat the layers one more time. Garnish with leftover toast crumbs. TIP: Add fresh fruit, such as bananas, for a more filling snack.